The Devil’s Whore and New Worlds are two different Channel 4 (UK) miniseries set in the 17th century. The Devil’s Whore came out back in 2008, and New Worlds has recently become available in the US (and I just finished watching it), so you’re getting a two-for-one, as I review both! I totally missed this British miniseries when it came out, and I confess, the title conversely made me think of cranky Puritans and boring giant-white-collar butter-churny dresses … I was wrong! This was GREAT, and the costumes were gorgeous! Andrea Riseborough stars as the fictional English aristocrat who is a part of Charles I’s court and then is caught up with Oliver Cromwell and Co. during the English Civil War. Sure, it’s awfully convenient that Angelica happens to be involved with all of these key people, as well as different events and movements of the period, but hey, that’s the fun of good historical fiction. She starts off young and somewhat unsure and, over the course of many trials and tribulations, finds (A) love and (B) herself … and Michael Fassbender plays her love interest, which: RRRRRRRRRRRRRRRRRRRRRR! 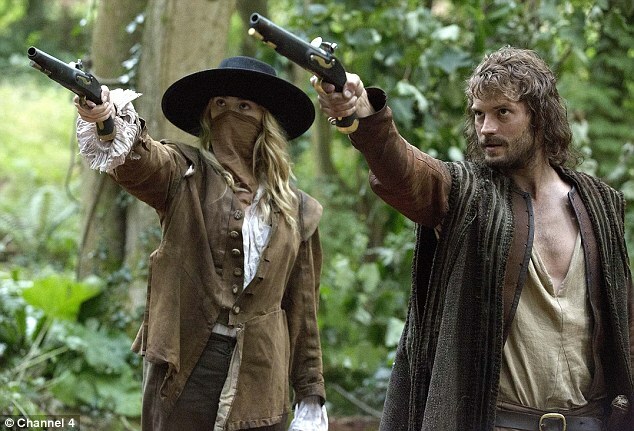 Dominic West plays Cromwell, and while West can be attractive, he’s definitely not in this! The costumes were gorgeous, with Riseborough in various beautiful 1650s-60s-esque dresses. They did stick with basically the same dress cut throughout the film, which ignores the developments of women’s styles over time, and they definitely needed more petticoats under the gowns. Clearly I missed the METAL GROMMETS when I watched this. Okay, and sometimes the off-the-shoulder was WAY too off-the-shoulder. I don’t know enough about men’s costume of this era to be able to say whether it was accurate or not — it certainly looked good to my eye, but maybe you can tell me more! If you like historical fiction (and I do), you’ll like this. New Worlds tells the story of people trying to create “new worlds” on both sides of the Atlantic. The main characters are Beth (daughter of Angelica, the lead character of The Devil’s Whore, who is now a utopian aristocrat), Abe (son of a English Civil War general), Hope (tomboy-ish, independent Massachusettsan), and Ned (son of a wealthy Massachusetts landowner). Supposedly I should remember Ned and Hope from The Devil’s Whore, but I don’t. Jeremy Northam as Charles II. Yes, cartoony evil villain Charles II, but whatever! Some surprisingly good dresses, mainly on Beth (costumes designed by Lucinda Wright). Don’t worry, we’ll talk about the hair in a minute. At one point, Beth ends up meeting Masca, who is HOT HOT HOT. Alex Meraz as Masca. HELLO SAILOR. Some surprisingly good full-bottomed wigs. A few of them were a little off, but by and large, I liked them! The Duke of Monmoth, rocking the full-bottomed wig. Eve Best, who played Angelica (the main character in The Devil’s Whore and Beth’s mother) was really quite good, AND I liked seeing a slightly older woman who looked very elegant. Sadly, I can’t find any pictures of her dressed up elegantly. The story actually took into account the perspectives of Native Americans and had white characters who came to understand and argue for their rights. Now, they may have gone a little TOO overboard in terms of whether the English would have actually been open to the indigenous perspectives, but at the same time, too few costume movies ever take into account the perspectives of the people who were getting the shaft (indigenous populations, slaves, etc.) — usually those people are just whitewashed out of the story. I am concerned that the hairdressers of the film/TV industry are on strike. 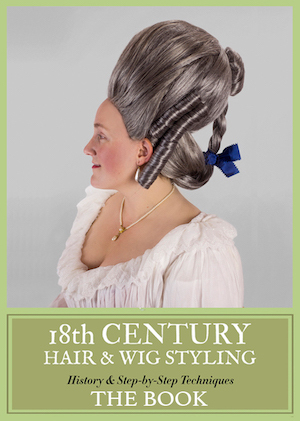 Why else is hair like this such a trend in most historical movies/TV shows? THIS IS DRESSED UP, THE DUKE IS VISITING HAIR. I’m not kidding. Another view. I think they may have used two whole bobby pins. 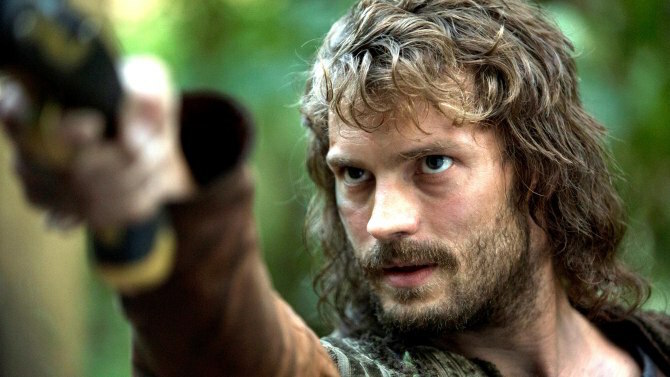 In the same vein, Jamie Dornan as Abe had the WORLD’S WORST SEMI-MULLET EVER. Who thought this was attractive? Apparently you can get from England to Massachusetts in about a day. Ned zips back and forth across the Atlantic in a heartbeat. Apparently ladies in utopian societies ran around in their shifts/chemises and nothing else. Also, if someone kills a deer in front of you, apparently you are likely to have blood sprayed ALL over you, and you are unlikely to notice. Hopefully a fake deer. Beth is about to get covered in its (fake) blood. 6. If you’re trying to pass as a boy, make sure to leave your long blonde locks flowing. Nobody will notice. They’re too busy being horrified by Jamie Dornan’s hair. In the end, it’s relatively entertaining, and you can join me in the eye-rolling and general scoffing! US viewers can stream it on Acorn TV. US viewers can watch it on DVD, releasing June 30, 2015. UK viewers can stream it on Channel 4‘s website. One of the things I liked about The Devil’s Whore was that Andrea Riseborough (who now seems to play exclusively hard-edged types) actually looked like a 17th-century portrait. Her hair, round cheeks, little mouth–paging Sir Peter Lely, we are ready for our sitting! 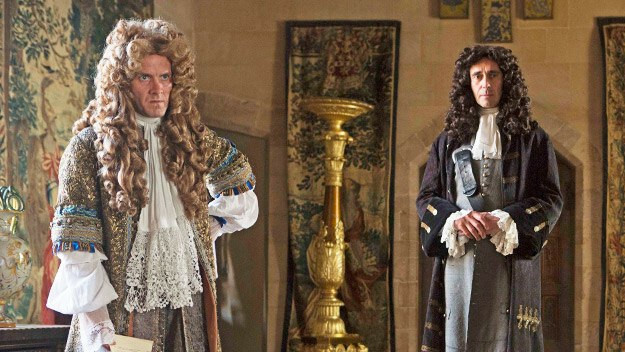 The details on the men’s costumes, too, was especially good; my husband often complains that the men’s outfits are afterthoughts, but here, Capaldi’s King Charles wears copies of Van Dyck’s portrait clothes (look at Aileen Ribiero’s Fashion and Fiction for detailed analyses of his and Queen Henrietta Maria’s wardrobes), and for all levels of society the textures are terrific. In the earlier court scenes, gleaming satin and beautiful bobbin lace, and in the later fighting scenes, buff leather coats as far as the eye can see. And of course, John Simm. And I didn’t know there was a sequel–thanks for the alert! Eve Best played Dolley Madison on a lovely straight-to-camera style documentary; can’t remember the name of it, but it might be still out there on PBS-land. You’re right! Andrea Riseborough does look like someone in a 17th century portrait! I think she reminds me of one of Queen Mary’s portraits in her younger days. I just checked IMDB–it was called “Dolley Madison–America’s First Lady” and it’s on YouTube in its entirety!